A package arrived on the doorstep. My pulse rate probably quickened, but I had no way of checking this. The heart monitor was in that package, along with a new Garmin Edge 800 GPS satellite-guided navigation bicycle computer. I’d been invited to take it on a test drive. I should explain that I’m not a techy-geeky-dudey-type guy. I know how to insert a DVD into my machine, but getting it to play…that’s what you have kids for. 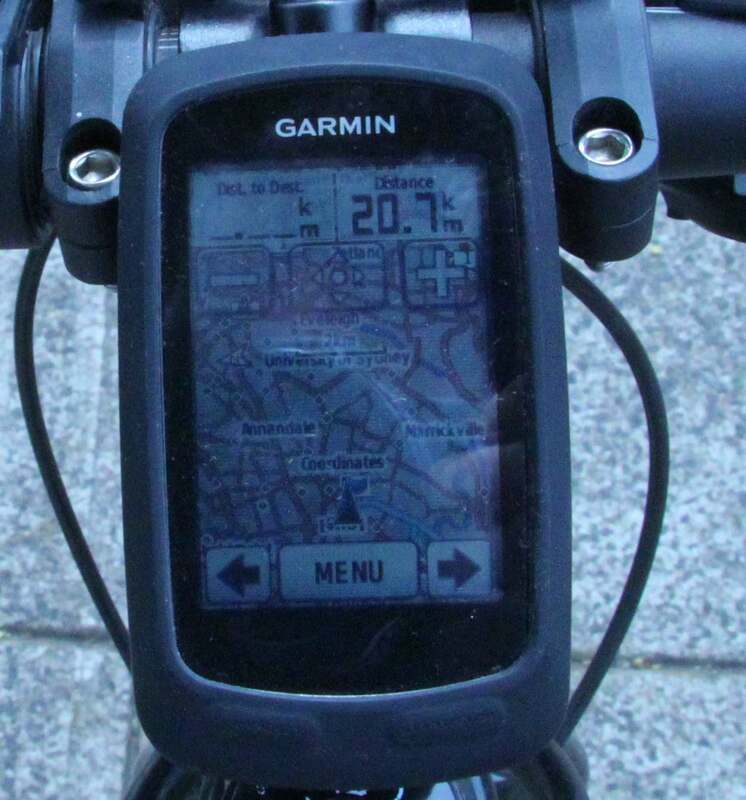 So maybe I’m not the ideal person to be reviewing a wham-bang, state-of-the-art Garmin Edge 800 GPS bike computer. On the other hand, if I can work it, so can everybody else. I’ve been riding bikes since before the launch of Sputnik. I know the way along my favourite cycling routes in Sydney and Amsterdam, and the Dutch ones have signposts giving the distance to the next town. I even know a clever trick for calculating average speed; I divide the distance travelled by the number of hours I’ve been riding. I learned to do this back when calculators filled large rooms in bank offices. Nonetheless, I was excited by my new Garmy’s arrival, because GPS thingies are fun. I was given a Garmin Edge 500 for my last birthday. I like it. I like knowing how far I’ve ridden. 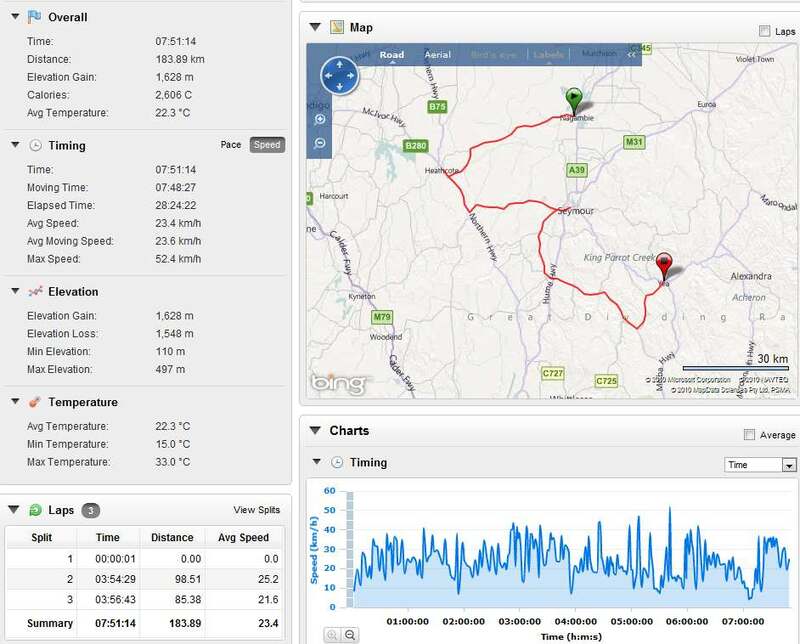 I enjoy trying to beat my best time on rides I do regularly, and I particularly like being able to upload the details onto the Garmin Connect website to show to others. Nobody’s interested of course, but I show them anyway. I make pretty maps of my rides which I can publish on this site. To see the full readout of the route, click here. The Garmin Edge 800 promised to do all the above, plus it had a navigation mode so it could tell me when to turn left or right. Normally Mevrouw T performs this function, but she isn’t always available to go cycling with me. I took Garmy 800 with me on the recent Great Victorian Bike Ride. I also took my son, which is way better than having a manual. He couldn’t wait to get Garmy going, and found the on/off switch in no time. I was impressed. Garmy began by asking me some rather personal questions about my age and weight. I thought this was a bit rich, since we’d only just met, but not wanting to offend, I answered them as honestly as I could. I liked the display. It’s bigger than the 500, in colour, and it was nice to see the gradient displayed alongside my speed and kms travelled. It was particularly encouraging when I conquered a short climb of 14 degrees without having to get off and walk. I also liked the ‘virtual training partner’ option. This means you set what you think will be a challenging speed to keep up and a little man starts riding his bike along at that pace. We had some hills coming up, so I set my little man pedalling at a modest 20kph average and was delighted to see I could leave him eating my dust most of the time. Then we tried out the navigation function. Garmy offers a map (too little for me to read without my glasses) and flashes advice on when to turn left or right. The trouble was, I already knew where to turn. The Great Victorian Bike Ride route setters had thought about scenery, safety, road surface, suitable rest areas and athletic challenge. Garmy couldn’t compete with that. For instance, it assured us that the distance from Heathcote to Seymour was 127km. We were expecting it to be about 30km. The discrepancy was because we asked Garmy to avoid major roads, so it decided we should make a major detour. It’s encouraging to know that the human imagination is still better than a computer in some respects. Driving a car, you generally want your GPS to take you on the shortest, most direct route to the destination. Touring cyclists on the other hand are constantly balancing convenience with a whole lot of other considerations. I would like to be able to plan a route before the ride on Google Maps, say, then download it from my computer to the GPS, knowing that it will now give me advice without my having to stop to refer to a map again at intersections. I would like to be able to link up a series of day rides on the Garmin Connect website to make a complete map, with stats, of a multi-day ride. When Garmy 800′s battery needed recharging after about two and half days of riding, everything automatically reset. Perhaps there is a way to avoid this, but I failed to find it. 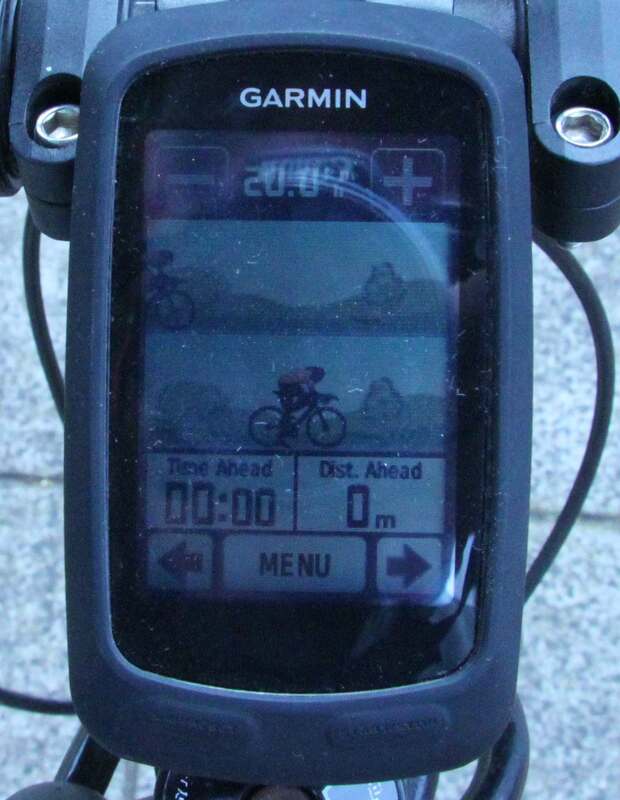 The bottom line is, I don’t need a Garmin Edge 800. Who does? Even Cadel and Lance have team captains whispering into their earpieces to tell them how they’re going (or ‘how they’re doing’ in Lance’s case). The very bottom line is, I want a Garmy anyway. After all, I don’t need lycra jerseys, or a smart bike, or cleats, or cool-looking shades, but I have them all. They make riding more enjoyable, and so does Garmy. I’m going to have another birthday soon. If anybody loves me a lot, you can get me a Garmin Edge 800, including Aust/NZ TOPO maps, $649 from Highly Tuned Athletes. Thanks to them for lending me this one to try. It was fun. FROM HTA: Would you like to win a Garmin Edge 800 of your own, enter our free competition open till 24th February 2011. The post REVIEW: Garmin Edge 800 what kind of cyclist needs GPS navigation (by Richard Tulloch) appeared first on Highly Tuned Athletes.